How to get there: The easiest approach is from the Turtagrø hotel located near one of the hairpin switchbacks in the Sognefjell road. 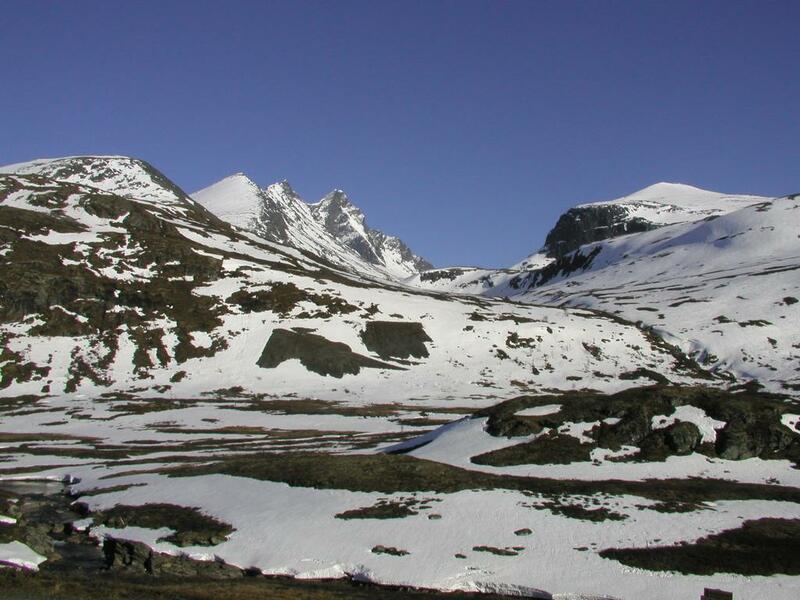 Route description: From Turtagrø one hikes straight into the valley and climbs the pass called `Bandet' at the very end. There is a self serve DNT hut located at the pass. From here there are two main routes with several variations. 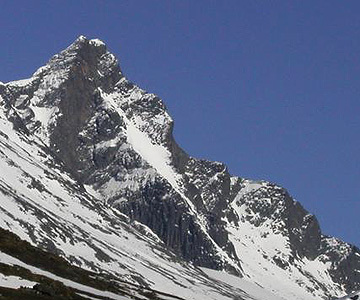 B: This route is the shorter and more popular in order to climb the summit. From the DNT hut one proceeds straight up the ridge, the climb here is scrambling requiring the use of hands, but with many large blocks, ledges and shelfs. The route gets steeper higher up and one should stay far to the left in order to avoid a section that has both exposure and requires roped belays. After this the route angels to the right and one should locate a point called `Hjørnet' (The corner), where the technical part of this climb begins. Now follows four distinct sections. i) The first part contours around the corner (to the right) and descends a little to reach a distinct horizontal ledge. ii) The second part follows the ledge. iii) The third part climbs a few small sections, while continuing to the right until one arrives at a nice shelf with a distinct chimmney about 3 meters above it. iv) The last section involves getting into the narrow chimmney (named Heftye's Renne) and climb it to the end, this is technically the most difficult point rated a IV+ using the Norwegian system. From the end of this section the climb contiues, but now less steep and more like a scramble, until a final pitch to the very summit that is again a bit more technical. Comments: This mountain was first climbed by William Cecil Slingsby from England, in 1876. 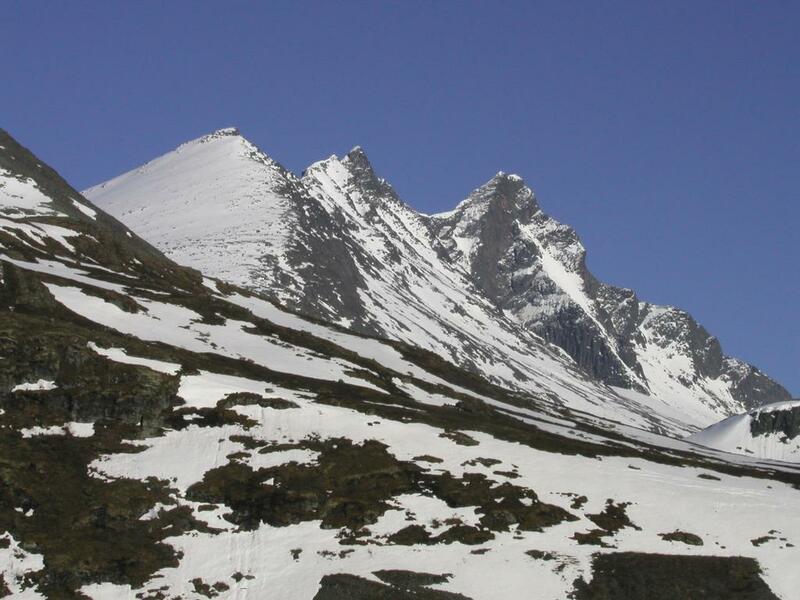 This event is generally regarded as the beginning of Norwegian climbing and mountaineering. Slingsby climbed solo from the pass `Mohns skar' (see describtion above). Store Skagastølstind as seen from Turtagrø on the Sognefjellet highway. Store Skagastølstind a closer look, the picture is from May 17th 2002.